Berenike II was the younger sister and wife of Ptolemy III Euergeter I – the third ruler of the Ptolemaic Dynasty. She was the daughter of Ptolemy II Philadelphus. 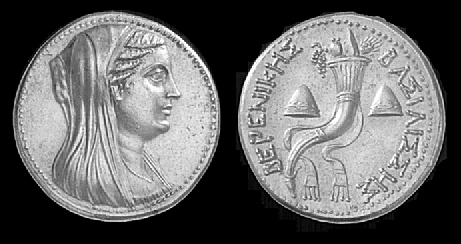 Ptolemy III’s elder sister was given in marraige to Antiochos II of the Seleukid Empire (Syria). Upon her murder, Ptolemy III began a series was wars during the early part of his reign to avenge his sister’s death. While Ptolemy III was absent from Egypt, Berenike II ruled Egypt between 246-241 BC. The extensive coinage baring the single portrait of Berenike II was most likely struck during this period. Earlier issues normally display her portrait jugate and behind that of her husband.